LOS ANGELES -- Mandatory evacuation orders have been issued for 1,000 homes in two foothill suburbs east of Los Angeles in advance of a powerful storm. The cities of Glendora and Azusa issued the orders Thursday for homes that could be endangered by debris flows from nearly 2,000 acres of steep mountain slopes burned by a wildfire last month. "You've got a recently burned hillside here with limited vegetation and a very steep slope. It's a recipe for what the experts say is potential for a great deal of damage," Sgt. John Madaloni told CBS Los Angeles. For days, both cities have been making extensive preparations including sandbagging. California received widespread rain Wednesday and early Thursday from the first of two back-to-back storms. The more powerful second storm is due overnight. "This is going to look like Niagara Falls after the next two inches of rain," homeowner Ed Heinlein said of a retaining wall he recently built. The weather system moved down from Northern California, bringing up to an inch of rain in drought-stricken coastal and valley areas of Los Angeles County, and more in the mountains. About an inch of rain fell earlier around the San Francisco Bay Area. Authorities urged commuters to drive with caution as some Los Angeles-area freeways saw water pooling in lanes. An early-morning rockslide was cleared from a Malibu canyon thoroughfare and no injuries were reported. The storm - and the far larger one expected to arrive Friday - brought worries to the suburbs of Azusa and Glendora about 25 miles northeast of Los Angeles at the foot of the steep San Gabriel Mountains. Wildfires that scorched 2000 acres of hillside last month burned the vegetation that keeps the hills from sliding. In Azusa, where mudslides threatened about 1000 homes, police went door to door telling people to evacuate. Matt Albanese was building barriers to keep the mud out. "We installed these footings that go down three feet with three inch steel pipe," he said. "So that was done yesterday. Today is actually building the fencing." Glendora provided thousands of sandbags to residents who streamed into a city yard to fill the bags and drive them away. "I'd like to stay, but I'm prepared to do whatever the Fire Department asks us to do," Mary Waldusky told KABC-TV, as volunteers lined sandbags along her foothill neighborhood. "We're ready to evacuate with our daughters." Sandbags were also being provided in other communities near Los Angeles, where other fires have burned in recent years, including the area of the May 2013 Springs Fire in the Santa Monica Mountains. The National Weather Service said the second storm will be stronger and move across Southern California from late Thursday through late Saturday, reaching Los Angeles County early Friday morning with rainfall amounts ranging from 3-6 inches in the foothills, and up to 8 inches in localized areas. Southern California's forecast included the possibility of isolated waterspouts and small tornados starting early Friday in Santa Barbara and Ventura counties. 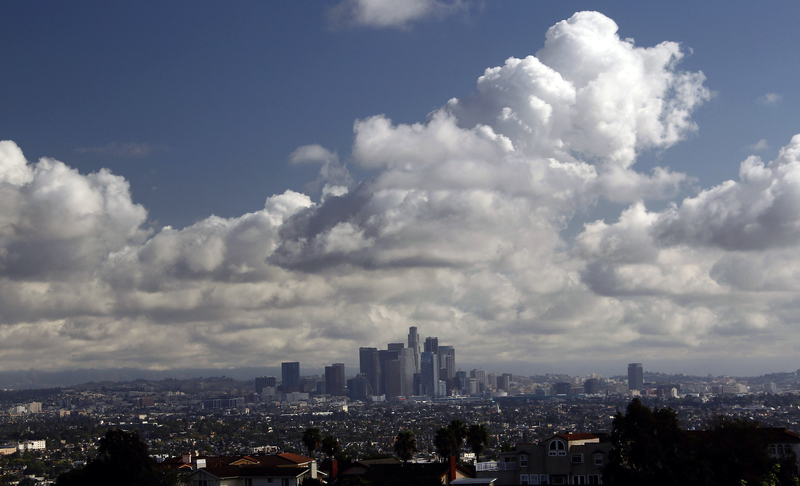 The conditions will then slide south into Los Angeles County, the weather service said. A wind advisory was scheduled to be in effect until midnight in the San Gabriel mountains and the Antelope Valley. An even more serious high wind watch will be in effect in the Antelope Valley from late Thursday through Friday evening. "We're going get more rain in the next 48 hours than we've seen in the past two years, said Bill Patzert, a NASA climatologist. But he said that the rain would not end California's drought. "This storm is what I call a down payment on drought relief but there is no quick fix for a drought that is this deep and this long," he said. State water officials planned to survey the anemic mountain snow pack, and will likely find that California's precipitation is badly lagging what's needed to quench the region's thirst after 2013 ended as the state's driest year on record.